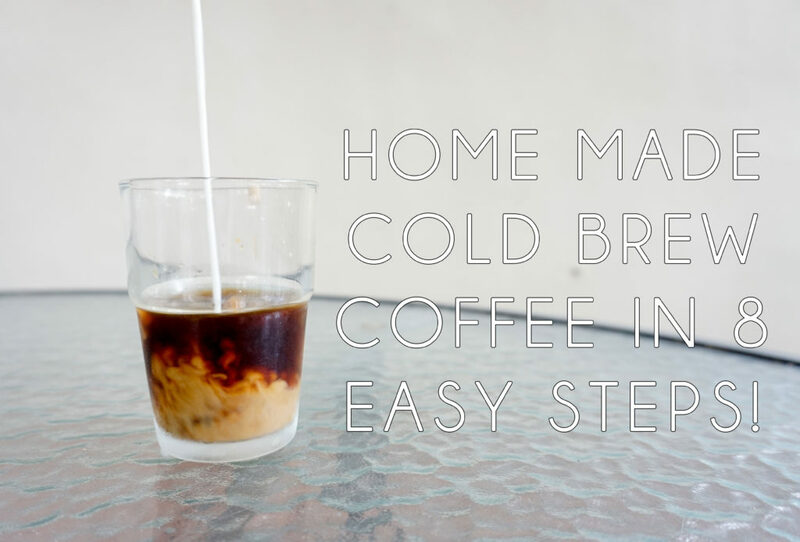 Cold Brew Coffee at home in 8 EASY steps! 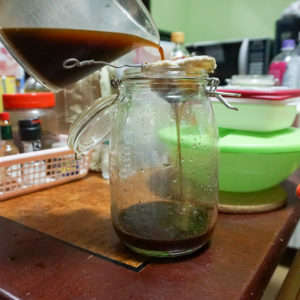 Ever wondered how to make Cold Brew Coffee at home? It’s actually very simple! All you need are a few items you can find around your household and a bit of your time. The first step is to weigh your beans. 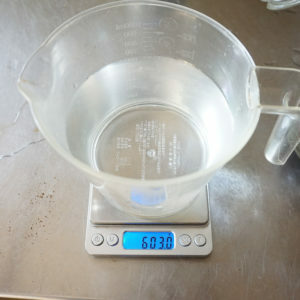 Use a kitchen scale to weigh your beans. 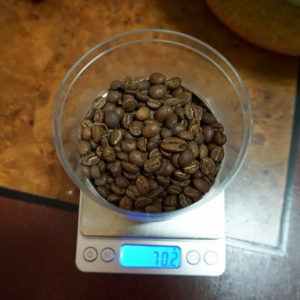 Over here, I am going to use about 150 grams of coffee (picture shows 70g cause the container can’t hold that much). Cold brew coffee is best made with fresh roasted coffee that you can get from your local coffee roasters/cafes, try not to get off-the-shelf coffee as it heavily affects the taste. With cold brew, the date of roast is a little more forgiving than when you use it to make espresso. For espresso, you always have to use the freshest coffee you can get your hands on. The next step is to grind your beans. 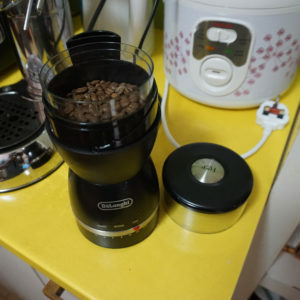 The grinder that I am using is a DeLonghi KG49 Grinder. For Cold Brew, using a blade grinder like this is more than sufficient to get the grind size required for making cold brew. The grind size that you want to aim for is something coarse, similar to sand. Once you have grinded all the beans, empty it in a jar that’s big enough to hold the grinds and the water that we will be putting in later. 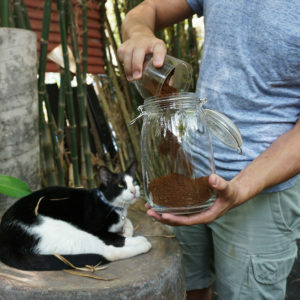 This jar was bought from IKEA for SGD $3.90: KORKEN Jar with lid. Here’s the IMPORTANT STEP! The key to making good cold brew is the ratio that you use. I have experimented with several ratios and found this to be the best for me. A quick search on the internet brings about ratios ranging from 1:3 to 1:16. 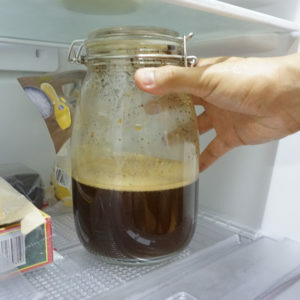 The recipe that I will be using is to make a cold brew concentrate, to be mixed with water or milk later on. I am using a 1:4 ratio. Meaning 1 gram of coffee to 4 grams of water. Pour the water that you have measured into the container. Ensure all the grinds are wet by giving it a quick swirl using a spoon, or you could just spin the jar. But do not spin it to hard or it might disturb the extraction process. Step 6: Leave it in the fridge! Here comes the tough part, waiting for it to brew. Unlike normal brewing methods, cold brew does not have any heat introduced to the coffee grinds, therefore extraction takes a longer time. The longer you put it in the fridge, the better the flavour. However, be careful not to put it in too long or it will taste bitter! Leave it in the fridge for a minimum of 12 hours. Stopping the extraction process early may result in sour flavours. However, I like my coffee to be slightly stronger. I let my coffee sit in the fridge for 18 hours. Finally after 18 hours of cruel waiting, we can finally filter the coffee! 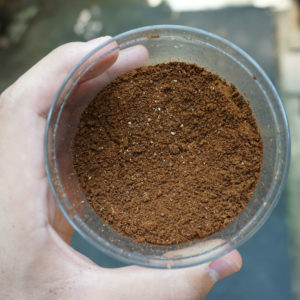 Most articles and recipes would call for a paper filter like the one used in the V60 pourovers. 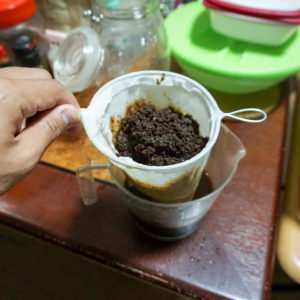 However, being the Singaporean that I am, I will be filtering it using the good ol’ kopi (coffee) sock! It’s cheap, re-usable, and easy to find! What you wanna do here is to find another container to pour the coffee into from the jug. Ready the sock over the container and pour all the coffee in, don’t forget to get the grinds in there too. 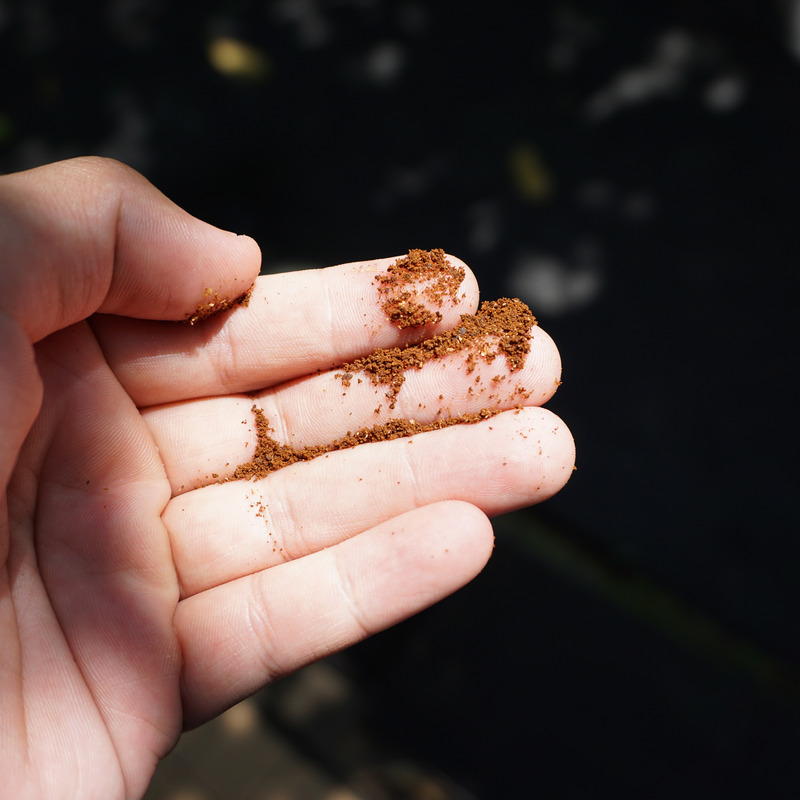 Once everything is in, use your hands to squeeze whatever that is soaked up in the grinds. After all, every drop counts! 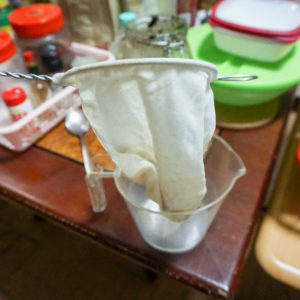 After the first filtration, use another sock to do a double filtration to ensure that no grinds contaminate the cold brew. The sock I am using the in the picture above is double layered. All that’s left to do now is enjoy! Mix the concentrated cold brew coffee with either milk or water as desired to your taste. The cold brew coffee can stay fresh for about a week+ as long as you keep it in an air-tight container and store it in the fridge! What a convenient way to grab your caffeine fix! SHARE this post on Facebook if you liked it! Don’t forget to follow us on our Social Media!